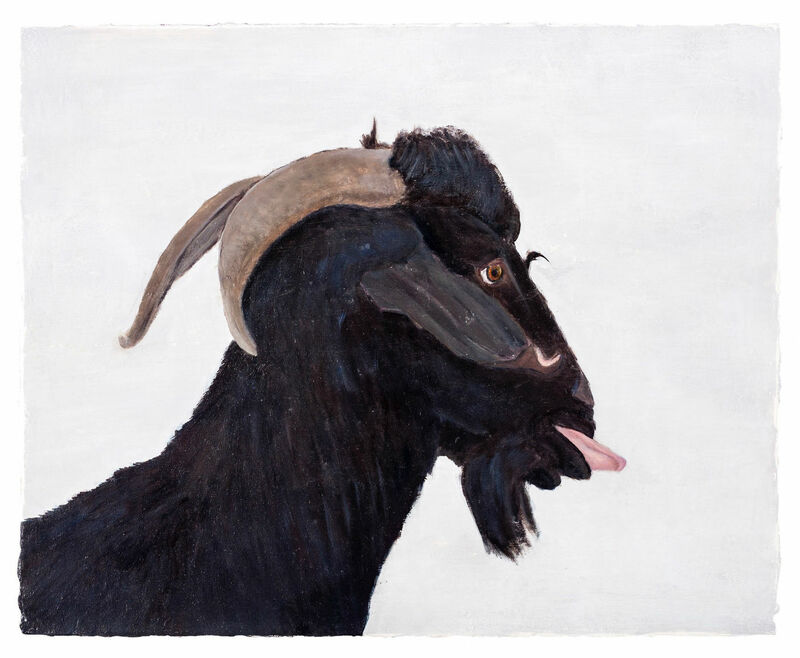 Berlin-based artist David Benforado presents a solo show at Kourd Gallery in Athens with portraits of goats he has met during his trips on Cycladic islands. Fascinated by their anatomy and resilience, the artist paints a series of images that reflect his impression and own personal symbolism of goats infused with memories of Greek island landscapes and little goat farms. David Benforado, Kassandra. Courtesy Gallery Kourd. 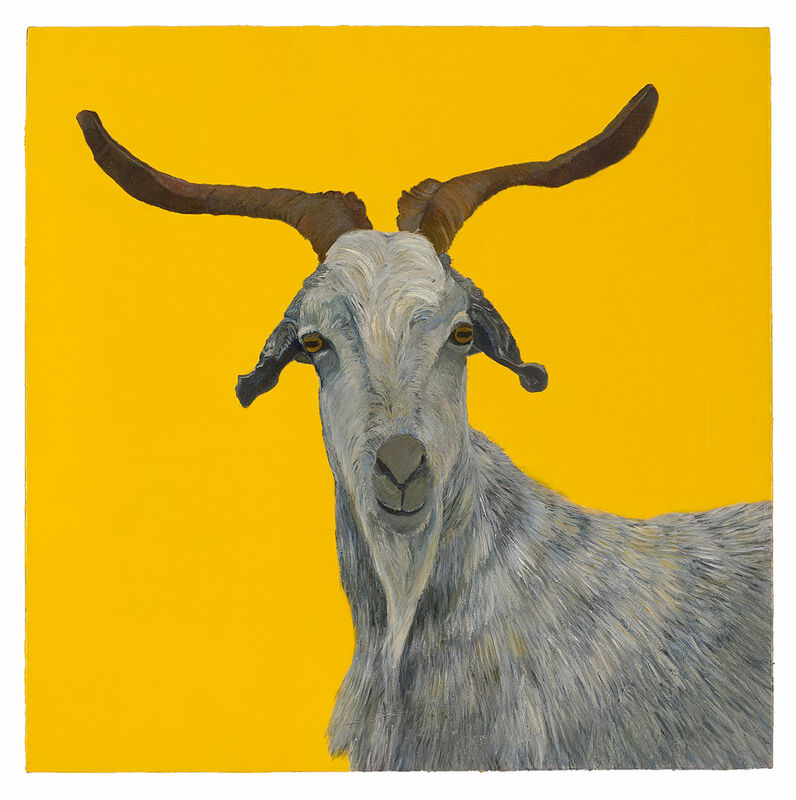 David Benforado chooses to paint a series of goats, outside their pen, away from the herd. They come across as proud, imposing and courageous, at the same time familiar and inaccessible. These oil paintings are clearly portraits. The eyes and muzzles, the fur and the horns, the ears and each tongue, the way the movement of the head, the neck or the back are portrayed - all this reflects the idea of human characteristics and traits. They echo a personal identity, qualities and attitudes which remind us of paintings portraying human beings, a tradition that dates back to the European Renaissance all the way to Pop Art. The goats are aligned, figures with heterogeneous characteristics that produce a sequence of individualities, referencing serial art processes in Pop Art. Most goats appear on strongly coloured surfaces, that stand in the background like pages dominated by pop colours. Every now and then their form emerges from a mysterious background, an atmospheric landscape, a place for fantasy or theatre. They are born out of a time long ago, the time of fairy tales, stemming from the time of tragos (the Greek word for goat) and tragedy itself. They seem to have come a long way down here from mythical spaces. Archaic and modern, innocent and magical, wild and tamed, these creatures seem to occupy the canvases in order to confront the viewer. The painter has created the goats using dry pigments and old techniques. They exert a fascination which derives primarily from the sense of an unexpected sudden dramatic event which happens in the moment when the intense and somehow surprised gaze of the goat meets that of the spectator speaking him of a “short drama”. David Benforado, Giannis Skaribas. Courtesy Gallery Kourd.